If Design Thinking is Dead then What Next? An article today really caught my eye. Design Thinking Is A Failed Experiment. So What’s Next? Design consultancies that promoted Design Thinking were, in effect, hoping that a process trick would produce significant cultural and organizational change. From the beginning, the process of Design Thinking was a scaffolding for the real deliverable: creativity. But in order to appeal to the business culture of process, it was denuded of the mess, the conflict, failure, emotions, and looping circularity that is part and parcel of the creative process. In a few companies, CEOs and managers accepted that mess along with the process and real innovation took place. In most others, it did not. As practitioners of design thinking in consultancies now acknowledge, the success rate for the process was low, very low. So what is Creative Intelligence, or CQ? Let me start by saying it is a concept in formation and I hope our conversation over the next months will give it a true, deep meaning. Above all, CQ is about abilities. I can call them literacies or fluencies. If you walk into one of Katie Salen’s Quest to Learn classes or a business strategy class at the Rotman School of Management, you can see people being taught behaviors that raise their CQ. You can see it in the military, corporations, and sports teams. It is about more than thinking, it is about learning by doing and learning how to do the new in an uncertain, ambiguous, complex space–our lives today. At this point, I am defining Creative Intelligence as the ability to frame problems in new ways and to make original solutions. You can have a low or high ability to frame and solve problems, but these two capacities are key and they can be learned. I place CQ within the intellectual space of gaming, scenario planning, systems thinking and, of course, design thinking. It is a sociological approach in which creativity emerges from group activity, not a psychological approach of development stages and individual genius. Somehow, for a time there it seemed like executives thought that if they bought into a program of design thinking then all their problems would be solved. And we should be honest, many designers were quite happy to perpetuate this myth and bask in their new status. Then the economy tanked and as Kevin wrote in a really brilliant article published on Core77, “Many who had talked their way into high-flying positions were left gliding” Greater exposure to senior management’s interrogation had left many, well, exposed. The design thinkers had been drinking too much of their own Kool-Aid. This isn’t about left brain vs right brain. This is about the need for analysis and synthesis. Both are critically important, from data analytics to complexity management to iteration and rapid prototyping. It’s interesting that she picks up on the whole left brain right brain view of the world, while also referencing the intuitive Steve Jobs, someone whose confidence “allows him to take risks and make intuitive bets”. 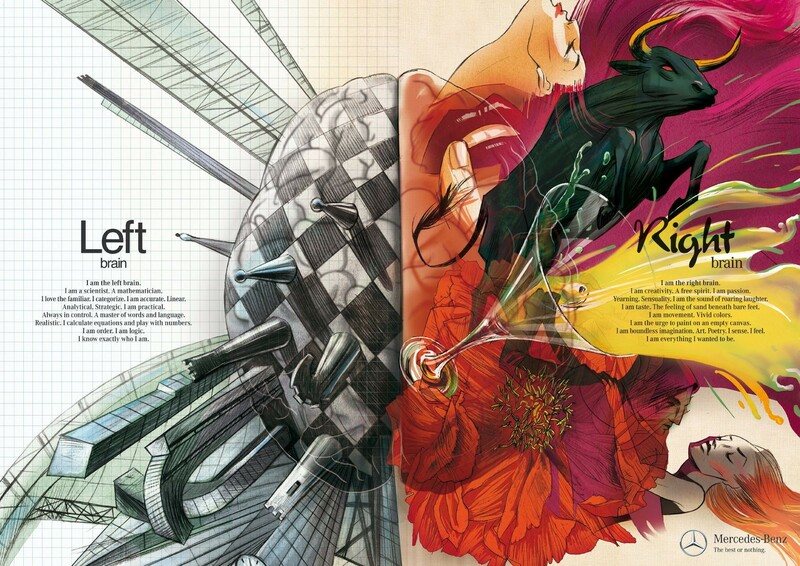 I myself talk a lot about the differences between the left and right brain, but not necessarily in this particular way. 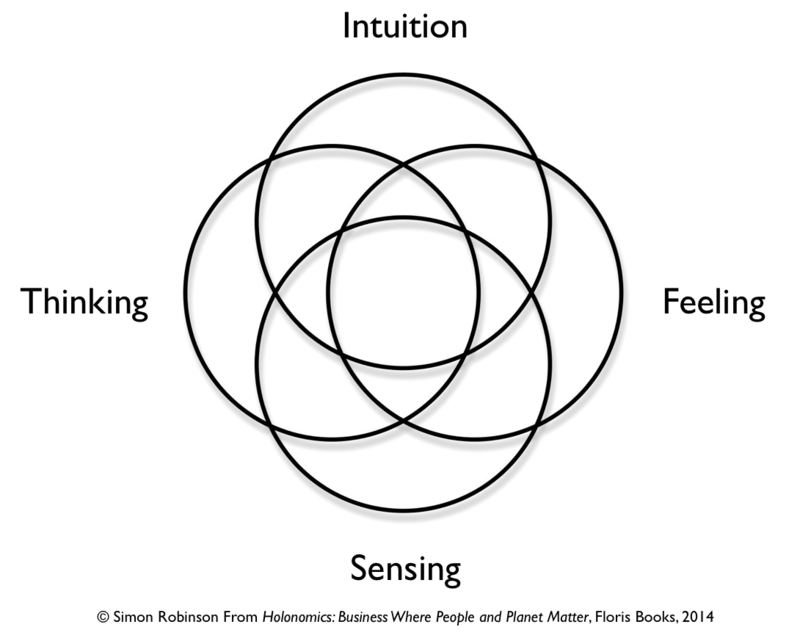 For me, rather than Design Thinking, we need a more integral way of knowing the world, one which does not rely so heavily on our faculty of thinking, but one which integrates our faculties of sensing, feeling and intuition. All of us are a mixture of these four ways of knowing, but some of us are dominated by one particular dimension. It is important to understand that these terms are not necessarily related to their common-use terms, intuition in particularly. Whereas we often see intuition as feeling, where we have a feel for what might happen or what is best, in this instance it refers to the scientific sense of intuition, where we are able to grasp or perceive a phenomena of nature, not in abstract intellectual categorical terms, where the phenomena can be described symbolically, in a model, with language or maths, but in our intuitions. Recent reports by IBM and KPMG both show that while CEOs recognise complexity as their greatest challenge, they do not know how to cope or manage it. When asked what the word complexity means to them, the majority of business executives respond in the negative, associating the word with difficult, complicated, hard to understand. In a recent article of mine I discussed how Tim Brown had said that his inspiration comes from the design of complex systems and science, whether of the natural world or the science of complexity. Many of his ideas such as the importance of understanding emergent behaviour, come not just from science, but the history of science. A small number of companies have discovered that embracing complexity provides them with a competitive edge in terms of responsiveness, information management, creativity, innovation, and human resources. But imagine the competitive edge if you could develop all the people in your organisation to really begin to utilise the much neglected right side of their brains. This side of the brain when unlocked really opens the world up to us in ways in which we could never have imagined. It is not about the thinking left brain and the artistic right brain. It is far far more than that. Iain McGilchrist has written probably the best book about how the two combine, and next month Henri Bortoft launches his new book Taking Appearance Seriously which perhaps for the first time provides a practical guide which leads us into what he calls the dynamic way of thinking, one which has been much neglected by science, but as McGilchrist suggests, if we can re-access, may well lead us out of many of the problems we face today. I know I need to explore this mandala, these ways of knowing in more detail, and I have some ideas on how to explain feeling, as I have not written so much on this. But for now, I just wanted to show that many people are exploring where we go now, and if we can motivate ourselves and energise ourselves to be able to undergo this transition of consciousness instead of being so wed or enslaved to our current mental models, then we will really start to make progress.